Music–It took me a few listens to really get into the music of The Lumineers. Their self-titled album, The Lumineers is a blood-pumping anthem of songs that requires a higher volume for listeners to truly appreciate. To me, the singer’s voice tends to fluctuate between soft and loud, creating a kind of high-low echoing effect. I believe that the band is best enjoyed at high volumes, preferably played loudly whilst one sings along on the open road. It’s also worth noting for this artist that the more you listen to the songs, the clearer their meanings become. “Stubborn Love” follows a man who can’t stop loving the woman who keeps letting him down and breaking his heart. It’s a love song, but the story creates a relatable experience of the ups and downs of love. Ironically, this is one of my favorite feel-good love songs. Music CD – Honeymoon by Lana Del Rey is a treat for her fans as well as those who like smoky, deep, lounge singer vocals. Her music has been labeled as alternative rock, hip hop, and indie. Her lyrics, many of which are written by her, are haunting and full of emotion. This CD contains 14 tracks. And I like all of them. Some of my favorite songs are: “High by the Beach”, “Terrence Loves You”, “Religion”, and “Salvatore”. Del Rey possesses an expansive contralto vocal range which spans more than three octaves. Ranging from high to low jazzy notes. She at times sounds like an angel, but don’t let her voice fool you, some of her lyrics can be quite gritty and explicit. Some of her most popular songs include “Summertime Sadness” from the CD Born to Die and “Young and Beautiful” from the movie The Great Gatsby. Some of Lana’s favorite artists include Bob Dylan, Frank Sinatra, Nina Simone, Jeff Buckley, and Leonard Cohen. Adele is a fan of Lana Del Rey. For total entertainment, check out some of her music videos on YouTube. 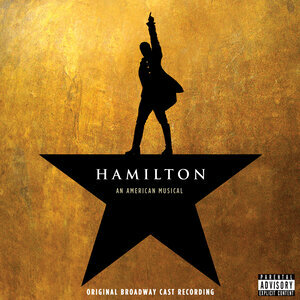 Music – If you’re into musical theater (or, indeed, if you watch late-night talk shows), surely by now you’ve heard of Hamilton, the outrageously popular hip-hop musical about Secretary of the Treasury Alexander Hamilton. If you haven’t: It’s a hip-hop musical. About Secretary of the Treasury Alexander Hamilton. It is, in a word, amazing. The story follows Hamilton (played by writer & composer Lin-Manuel Miranda) from his arrival in New York City in 1776 through the Revolutionary War, George Washington’s presidency, and to his death in a duel with Aaron Burr (spoilers!) in 1804. Burr, played by Leslie Odom, Jr., narrates, offering a little distance from Hamilton’s own relentless enthusiasm. The music is a brilliant mashup of theatrical flair and the past several decades of hip-hop, quoting both lyrically and musically from sources as diverse as Les Miserables, Beyoncé, Company, Kanye West, Gilbert & Sullivan, and Biggie Smalls. This show is so dense, complex, and uniformly strong it’s hard to pick out favorite pieces. General Lafayette’s (Daveed Diggs) rap in “Guns and Ships” is a huge amount of fun; Burr’s statement of purpose in “Wait for It” is outstanding; Thomas Jefferson (also Daveed Diggs, in a great piece of double casting) never gets his own showstopper, but he steals every piece he’s in anyway. When it comes down to it, though, it’s Angelica (Renée Elise Goldsbury) and Eliza Schuyler (Philippa Soo) I love best – their songs, particularly “Satisfied” and “Burn,” are some of the best depictions I’ve ever seen of strong women constrained by their place in history. If you get hooked, there’s plenty of American history to keep you busy, from Ron Chernow’s biography that formed the basis of the show to new titles like War of Two: Alexander Hamilton, Aaron Burr, and the Duel That Stunned the Nation and Lafayette in the Somewhat United States. Music – Dessa is a 33-year-old rapper and writer from Minneapolis, a part of the cerebral indie hip-hop collective Doomtree. Her style is much more musical than most rappers, but her skill with words is outstanding. (And fair enough – she graduated from the University of Minnesota with a philosophy degree at age 20.) She and the rest of Doomtree appear regularly on “most-underrated” lists of modern artists, but despite all this critical acclaim, she hasn’t yet made it big. It’ll happen one of these days, because Dessa is just too fantastic to ignore. Castor, the Twin is a remix album of many of her more highly-produced tracks from earlier albums, False Hopes and A Badly Broken Code. What that means is that this is a hip-hop album with a singer-songwriter feel. If Joni Mitchell did hip-hop beats, she might sound like Dessa. There’s not a bad track on the album, but my favorites are “Dixon’s Girl,” a sympathetic shout-out to under-appreciated and abused women in the music industry, and “The Crow,” which borrows the symbol of Edgar Allan Poe’s avian nemesis for a soul-baring song about loss and survival. Music – This is the new album from Andre Rieu and his Johann Strauss Orchestra, released in November 2014. Andre offers you his hand and invites you on a journey through the Venice night via gondola. It is a declaration of love to perhaps the most beautiful city in the world, and provides a popular selection of the most well-known Italian melodies. It is the theme Andre chose for his 10th anniversary of the Vrijthof concerts, from the romantic Dutch square in Maastricht, The Netherlands. Andre Rieu is the world’s best-selling classical musician. He has received more than 400 Platinum and 171 Gold Awards, and Love in Venice went straight to No. 1 on the Classical Charts. Andre and the Johann Strauss Orchestra – between 80 and 150 musicians – travel around the world performing about 100 concerts per year. They are as successful as some of the biggest global pop and rock music acts. Rieu is known as the modern day “Waltz King,” a title originally bestowed upon Johann Strauss II. He plays a 1667 Stradivarius violin, and he and his wife, Marjorie, do all the arrangements of the famous songs. I loved all of the music, but especially “Love in Venice,” “Volare,” and “That’s Amore.” There are 18 songs on Love in Venice, but the DVD has many more and is incredibly beautiful, festive and colorful. So sit back and allow your imagination to drift into gorgeous, romantic Venice with wonderful Italian music. Music – This is the new 2014 collaboration album by Tony Bennett and Lady Gaga. It consists of jazz standards by famous jazz composers like George Gershwin, Cole Porter, Jerome Kern and Irving Berlin. Cheek to Cheek was inspired by the desire of Bennett and Gaga to introduce the songs to a younger generation. It debuted at number one on Billboard and earned Gaga her third consecutive number-one album, and it extended Bennett’s record as the oldest person, at 88, to achieve number-one status on the charts. Of course, Lady Gaga (Stefani Joanne Angelina Germanotta) is one of the bestselling vocalists of all time, and has five Grammy Awards and 13 MTV Video Music Awards. Although her Pop albums – The Fame, The Fame Monster, and Born This Way – brought her great success, she now plans to do one jazz album per year. The legendary Tony Bennett (Anthony Dominick Benedetto) has 17 Grammy Awards and has sold over 50 million records worldwide. Cheek to Cheek is one of the best jazz vocal albums to come out in years, and it features scintillating big band arrangements and famous jazz musicians with the band. Every song is a delight, but I especially liked “Lush Life,” (by Billy Strayhorn), “Nature Boy,” and “Ev’ry Time We Say Goodbye.” This is a stunningly excellent CD, and it will keep your heart pounding. It also has a generous fold out photo montage, with candid photos of the performers.